My manager didn’t want a bike on his fleet. He thought they were unproductive. But Head Office said, ‘we’re not asking you, we’re telling you.’ So he had to find a rider. He asked if anyone wanted to do it, saying ‘bear in mind you’re going to be cold and wet all the time’. He was really trying to sell it, but I said, yeah. I’ve had the bike since March 2012. I haven’t done a full winter on it yet. The bike is an 11-plate Pan European, but it’s already done 27,000 miles. It came out of London, and because the AA has the Carole Nash and Suzuki contracts, they wanted one in the Cardiff area. I attend the bikes, but the cars as well. 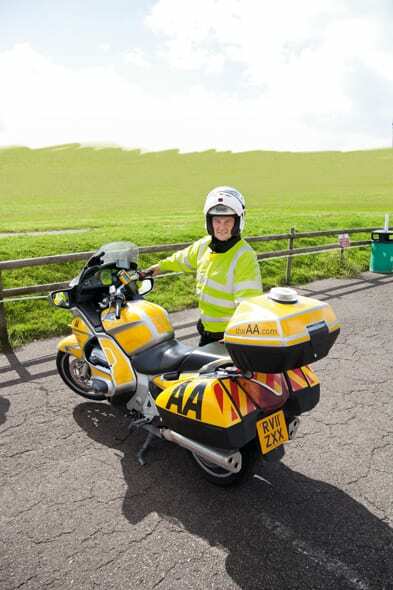 This is the only AA bike in South Wales. Before I could use it, I had to pass IAM. But I can ride a bike. I used to race motocross in the AMCA British championship, that was back in the 1990s. My best finish was third, and I was happy with that. So I can ride a bit. Truth be told, I can wheelie a motocross bike for as long as I like! The Pan European is a good bike. The police got rid of all of their Pans because of the weave that you get at high speed. I wouldn’t know about that! The copper reckoned you could catch anything on a Pan, but the BMW’s they’ve got now wouldn’t catch a Transit van according to him! There’s a stack of clever stuff on the bike. I’ve got diagnostics on the computer with a 16-pin lead that sorts most cars and bikes, a compressor to pump up tyres, a battery tester and charger, jump leads, hand tools, a socket set and spanners, that sort of thing. Right now, I haven’t got a job on. I’m unproductive, as they say. I’ve got the sat nav and the phone that gives me all the information I need. It loads all my jobs, so I know exactly where and when I need to be. But as I hadn’t got a job on I saw you lot riding round (we were at Llandow, testing – Ed) so I thought I’d pop in and have a look! The last bike job I did was on a Suzuki. It was just a temporary puncture repair, just to get a chap home. Repairing tyres is a dodgy area. These repairs are purely to get someone home, they’re not designed as a permanent fix. So we’ll do them, but remind people that they must get it changed. You shouldn’t risk it, especially on a big bike. It’s just not worth it. It’s cheaper to get a temporary repair done. Then you get someone on their way than stick them on the back of a truck. Trucks cost money, it’s as simple as that. The AA’s procedure is to send a patrolman out whatever the problem. I had a call out the other day. It was for a Bentley. This bloke in his Bentley reported a noise coming from the front of his car and he couldn’t move it. I came out and had a look. He was going ‘Why have they sent you, I need a truck’, so I explained about the procedure. Anyway, it’s got these big Brembo calipers and a stone had jammed in the back plate. I stuck my finger in, popped the stone out and that was it. He was in the process of booking his car in to the Bentley garage to be looked at, but I’d dealt with it in 10 seconds. The biggest problem on bikes are regulators. Someone will start their bike up, go for a ride, then they just stop – or they find they can’t start it again. Batteries tend to go just at home, so once you’re on the road regulator failure is what most bike call outs are for. On the whole it’s the older stuff on the bike side that breaks down. My bike is equipped with leads, I can plug it into another bike, keep my bike running to charge a battery and then I follow you home. If you give a battery a full charge it’ll last 15 minutes or so, which is usually enough. No single manufacturer, car or bike, sticks out for breakdowns. Every manufacturer’s stuff breaks down, right across the board, cars, bikes, everything. Even if one did, I wouldn’t tell you! I don’t want to be the next bunch of flowers and T-shirt. Riding round I get to see a lot. On the bike what worries me is seeing all these corners in the Brecons and around Abergavenny with a bunch of flowers and T-shirt on it. It makes you think and I don’t want that to be me. In the van I was doing eight jobs a day. I’m now doing 16 jobs a day on the bike. So I’ve gone from probably about 15th in a team of 60 to number one! Which is good for me because I get a bonus. The more jobs you do, the more fixes you do, and the better bonus you get. It’s great! Don’t get me wrong, there are days where I really don’t want to be out in the rain, but otherwise I really enjoy it.